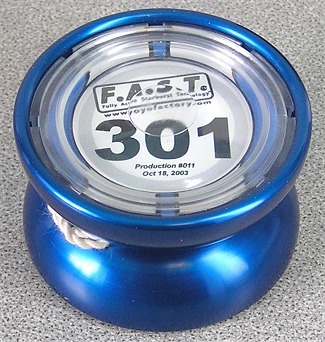 YoYoFactory released the 301 as the upper end version of their popular FAST 201. FAST stands for "Fully Active Starburst Technology", a unique response system patented by YoYoFactory. The construction includes an aluminum body with, plastic starburst response pieces, plastic lens caps, and printed logo inserts. A truly composite construction. Only 121 of these were made, and there were three different colors: Blue, Black, and Silver.